Timeshare owners buy dreams – not real estate – and successful resort operators, whether they are developers, management companies or owner councils, must facilitate those dreams. Here’s what you can do to create more successful renovations at your resort.Timeshare owners buy dreams – not real estate – and successful resort operators, whether they are developers, management companies or owner councils, must facilitate those dreams. Here’s what you can do to create more successful renovations at your resort. Timeshare renovations are big investments, with many moving parts. They require a plan, and that plan must start with a clear understanding of what renovation means to your resort. With clear goals, a thorough process and a good plan, the renovation will improve your property, energize and excite owners, and encourage greater on-time payments and resales. Without a plan, renovations often spiral into anxiety, disruption and disappointment. A major cause of renovation problems is the term, “renovation,” itself. In the real estate industry, where the timeshare concept originated, “renovations” are construction events that repair and return buildings to a former state. Timeshares, however, are businesses more than they are buildings, and we sell experiences as our products. Those experiences may involve activities, such as skiing, beach time or access to parks and amusements, or simple family time in an inviting living room. In any other businesses, a better term for what we do would be product improvement – and it always ongoing. For example, if you were responsible to make a better bar of soap or develop a new restaurant menu, you wouldn’t say you renovate it! You would improve it. The important distinction is that, in the time share business, you must improve continually. Resorts get into trouble when they spend tons of money on one-time improvements because, regardless of how much you spend, all improvements degrade starting immediately, and styles and owner preferences continuously change. The critical concept, therefore, is that timeshare “renovations” must be ongoing processes. 1. Make your owners happy they bought their timeshares. 3. Keep the place affordable. When renovations are approached as events and problems that must be overcome, they become too expensive; too time consuming; too disruptive; too late; too hard; too threatening. In fact, none of that is necessary. They are simply continuous mechanisms that make your property better. You have no time limits and every step you take improves your resort. In fact, if you consider renovation to be process you will do forever, and you develop a plan to progressively renovate, it will all become easy and fail-proof. Any budget will work. Rule #1: Renovate progressively within your budget and never stop. Do not think you must do it all at one time. Rule #2: Give your owners and guests surroundings that meet or beat their home environs. Remember they all live somewhere else, and they compare their units and surroundings with their homes every time they come. They don’t want downgrades from their home lifestyles and will never be happy with odors, dirty furniture, walls, floors or dishes, discomfort or outdated decors. Rule #3: Share owners think they own the place, and they do. They do not care about your problems or budgets. Rule #4: Start with the basics. Infrastructure is important. Fix odors and leaks, and provide adequate hot water and water pressure. Rule #5: Never skimp on mattresses or sleeper sofas. 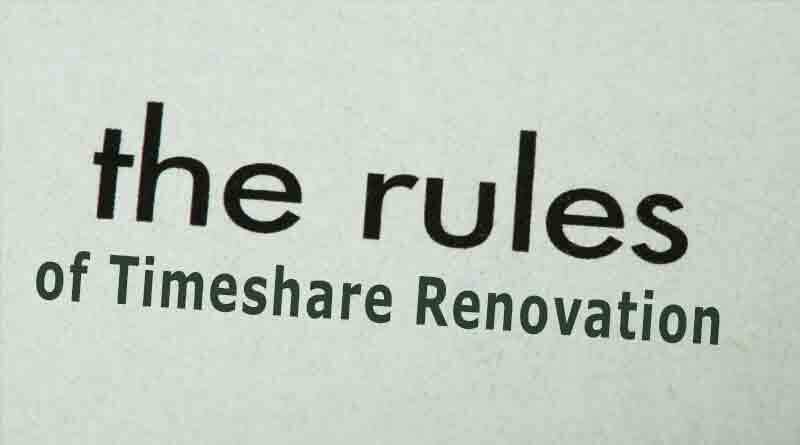 Rule #6: Share owners love visual change. Everything is important, but living rooms and bedrooms are most important. Renovate them at least every 5 – 7 years. Rule #7: Renovate by unit, and not by item. If you change out lamps one year, and the sofas another, owners will never get a wow feeling. Rule #8: Never skimp on quality. If you must adjust, do fewer units and extend your cycles. Rule #9: Never buy retail quality. It will not hold up and is more expensive. Always buy hospitality quality. Rule #10: Renovations are not construction events. After you correct any infrastructure problems, construction should rarely exceed 1/3 of your budget. Rule #11: Don’t buy anything or contract for anything without providing a clear specification. Don’t let salesmen decide what quality to put in your resort. Rule #12: Plan your renovations in long, defined cycles. You should always know what your annual cost will be for the next 20 years. Follow these rules and you will always and forever have a successful resort. Fail to achieve them and you have collection problems, poor resale values and spiraling management problems. Is that affordable for your resort? It doesn’t matter. Simply adjust the cycles to your budgets, and your resort will always look great. May 1, 2015 Marge Lennon Comments Off on Meet the People Who Make the Resort Industry Great! August 1, 2016 ResortTrades Comments Off on Big Enough to Deliver, Small Enough to Care.